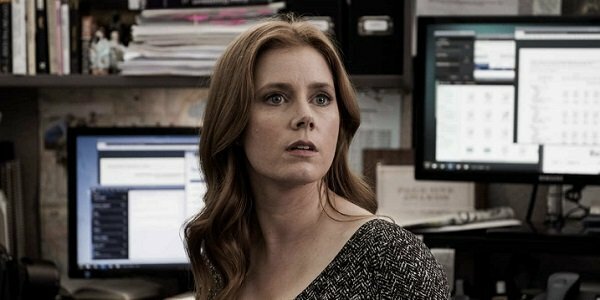 In the last decade or so, Amy Adams has carved out one hell of a career path, taking on both critically acclaimed award magnets and blockbuster box office monsters. Her next project, however, will see her making the transition to the small screen for the first TV lead role of her career, as she will front the adaptation of the hit novel Sharp Objects, which has been ordered to series by HBO. Someone keep a seat at the Emmys open for her. Sharp Objects will see Amy Adams taking on the role of the emotionally fragile Camille Preaker, a reporter covering the murder of two preteen girls, which takes her back to her small hometown. Camille was only recently released from a psychiatric hospital, where she’d spent a small amount of time, and the deeper she gets into the case, the more she starts to psychologically relate to the young victims. And you can probably imagine that things don’t get better from there. Adams attached herself to the project recently, and Sharp Objects was then sought out by several different interested parties, including Netflix, according to Deadline. HBO won out in the end, though, and gave the project a straight-to-series order for eight episodes. So unless there are some drastic creative changes made in the development process, we’ll likely only be getting Adams on our TVs for a two-month stint. Published in 2006, Gillian Flynn’s Sharp Objects was well-received at the time but got further interest when David Fincher turned the author’s Gone Girl into a spectacular movie. It was originally set up as a movie back in 2011 through Blumhouse Productions, which then spun it into a TV show as time went by, and now it’s officially coming at us with Flynn assisting in writing duties alongside showrunner Marti Noxon, the co-creator of the fab UnReal. And adding to the prestige of it all is director Jean-Marc Vallée, of Wild and Dallas Buyers Club fame, who will be behind the camera for all eight episodes of the series. Now, this won’t be Amy Adams’ first time in front of TV cameras. (Not even including her Saturday Night Live hosting gig or all of her talk show appearances over the years.) Her career started with bit parts on shows like That 70s Show and Buffy the Vampire Slayer before she got a couple of meatier parts in Dr. Vegas and The Office. The latter role coincided with her well-received indie Junebug, and a star was born. A star that stayed away from TV for the next decade, but we still like her. Currently in Batman v Superman: Dawn of Justice, Adams will soon be seen on the big screen in Denis Villeneuve’s presumably heady sci-fi flick Story of Your Life and Tom Ford’s thriller Nocturnal Animals. No telling when Sharp Objects will end up hitting HBO, especially since the network doesn’t follow normal TV seasons, but we can probably expect to see it kicking off on some Sunday night this winter.